OK, you've picked your song. The big day is looming closer and you're ready to start on your dance. What now? What do you need to be prepared for the big song? There are a few logistical things to consider before you can start working on your choreography. You want your dance to go off without a hitch, so you need to get these answers out of the way before continuing on. If you're working with a professional, be sure to tell them about the theme of your wedding and you as a couple. You want your dance to be a reflection of who you are. Also make sure you give yourself plenty of time before the big day to start working on your dance. The dance should be an enjoyable part of the preparations, not adding another major stressor, and if you wait until too close, you'll feel like you're never going to learn it in time. Here are a few other things to consider when crafting your first dance. Be sure to go over this list with your instructor to make sure your choreography will be ready to go! 1. When during the day will your dance be? Is it as soon as you walk into your reception? After dinner? During the cocktail hour? Decide on when you'll be doing your dance so you will know exactly where you'll be at the start of it and based on that, how to choreography your beginning. What is the size and shape of the dance floor? Will the head table and/or DJ/Band be right on the dance floor? Where will your wedding party be during your dance? Are they standing on the floor with you? Where will your guests be? Will they stand around the floor? Sit at the tables? Where will the bride's flowers be? Will you need to get rid of them before the dance? What is the setup of the room? Where are the entrance/exit points, etc? Where will your "important" people be (parents, grandparents, etc)? Are the tables/guests all the way around the dance floor or all on one side? These may seem like inconsequential questions but they're actually very important in determining how you will begin/end your dance, if you need to play up to one spot, how much space you actually have to dance, etc. It's also important so you'll know what to expect. One little thing - like your guests standing around the dance floor when you expected them to sit at the tables - can be enough to throw you off and you don't want that to happen! The size and shape of the floor is also important when you're practicing so you can map out the space and be sure you are practicing in the right area. Don't be afraid to call your wedding venue and ask about this. They are used to these types of questions and will gladly give you dimensions of the floor and go over the layout. It may sound like something that should go without saying, but you'd be surprised - Remind the wait staff not to cross the dance floor during the dance. Also remind your photographer and videographer to be sure to get some whole body shots too. Those close-ups are always nice, but you've worked hard on your dance and you want to have some pictures of the dance too! 4. Are you dancing to live music or a recording played by the DJ? If the answer is a DJ, your job is easy. Make sure your DJ has the exact version of the song you want and have been practicing to. Then make sure he knows what the cue is for him to start the music. If a live band is playing your song, ask the band for a recorded copy of exactly how they will play the song so you can practice to their version. When you are about to take your first step on the dance floor is not the time to find out that a song you thought was going to be a Foxtrot has been remixed into a rumba! Also, be sure to go over the appropriate cues with your bandmaster as well. If you plan on dancing the whole song by yourself or if you're inviting your wedding party and/or guests to join in partway. To give you at least 1 or 2 "picture poses" during the dance so you can be sure your photographer (and grandma) can get a great shot. To have some freezes and back-up steps - These are great just in case you lose your step, someone does walk across the floor, or something else happens to throw you off. These types of steps help you to regain your composure and get back into the dance without ever letting your guests know that something happened. Something to think about - How big is your dress? Will you be wearing a crinoline underneath? Is it flowy? Tight? Long? Short? Heavy? How is the bustle hooked, and will the back still be longer than the front? Yes, these all do make a difference in how you will do your dance. If you have a long, pouffy, heavy dress, there are just some moves you will not want to attempt. They not only will be hard for you to do, they just won't look good. Simple things like the bustle or the amount of space your legs will have will make a big difference as well. And just the fact that you are wearing a dress at all may throw your partner off, pouffy or not. There's something about the fabric moving between the legs that often throws even the best leader off. Be sure to practice ahead of time with some type of dress or skirt on. If you know you'll be wearing a crinoline underneath, practice with that on. Both you and your partner will be very happy you did, trust me! If you don't have anything to practice in, pin a bedsheet around your waist. It sounds stupid, but it does help to feel what it is like to have all that extra fabric around your legs (for both of you!). Will you be wearing your veil during the dance? What shoes will you be wearing? Is he wearing a tux jacket? Tux shoes? These make a difference too. If your guy is wearing a tux jacket, be sure he practices a couple of times at least with a suit jacket on. It feels very different dancing in a jacket than it does in the t-shirt and jeans he's used to. Tux shoes are also very slippery and often stiff. Have him practice in the slickest pair of dress shoes he has and be sure to try 1 or 2 moves that day beforehand in the actual tux shoes. Your shoes are also very important. You want to feel totally comfortable moving in them, so if possible, practice in your wedding shoes as much as possible. Also, remember to take some backwards steps at your next fitting to ensure that your seamstress is altering the dress short enough to make sure you will not trip on it while dancing. 8. Practice at least once every day. Everyone thinks that they need to set aside at least an hour to practice, but reality is, those extra hours don't come around very often. Aim to have at least 3-5 minutes a day to practice. Make it a part of your daily routine - brush your teeth then run through the dance, or something like that. Even just running through it that once will help you immensely. Dance has a lot to do with muscle memory. So the more regularly you use your muscles that way, the easier and more natural the dance will seem. On the extra busy days, just run through it that once. On the weekends or a lighter day, set aside a little more time to work out the kinks. No matter what, your guests are not going to remember every step you do. But they will remember if it looked like you were enjoying the moment or not. Even if you heaven forbid screwed up completely, if you keep smiling, all anyone will remember is how cute you looked and what a sweet dance you had. 10. Relax and enjoy the moment. Remember, this is your special time to celebrate your union. Your two lives become one out on that dance floor, and no matter what happens with anything else, that's all that counts. You will get to dance together for the rest of your lives but you only get your first dance once, so enjoy every second of that song! For more information about wedding dances, or to book a wedding package with Jenna, contact us at [email protected]. 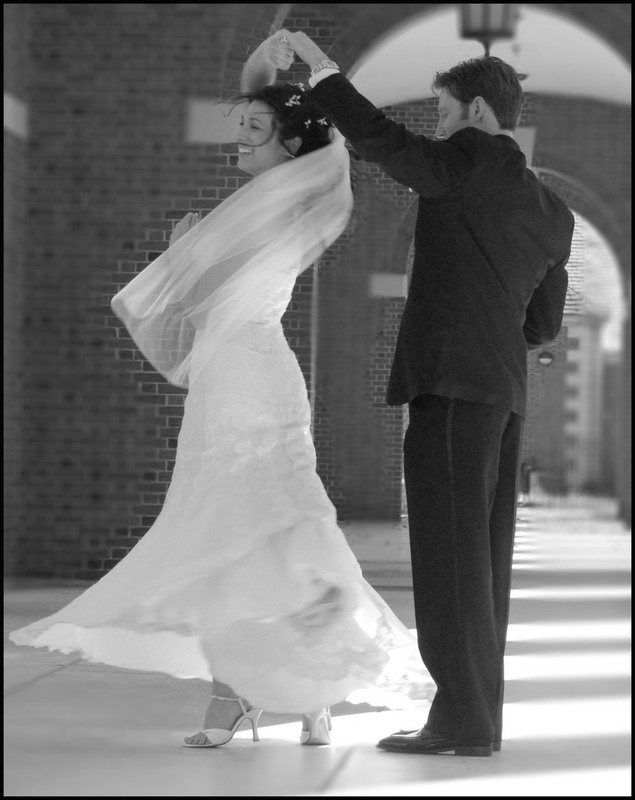 If you're in the Capital District, check out the Saratoga SAVOY Center of Dance for more information on available wedding packages.